Please welcome my Coffee Table posts to this blog. 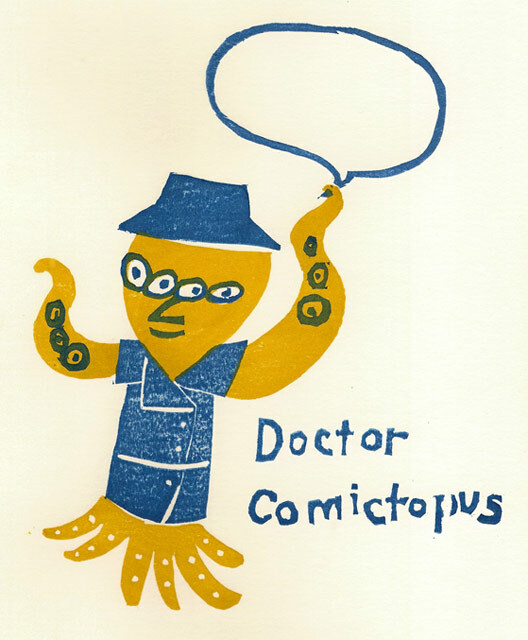 This one debuts here but some others first appeared on my former blog Doctor Comictopus. The basic idea is to set up a coffee table scenario that includes a coffee table art book as an accoutrement to the cake and coffee and possibly relate the choice of materials to some current event. That would be a comics art coffee table book of course, usually large, hard covered and heavy although the one featured in this post is soft covered and light but does relate to a topical event. The plan is to pull one book out of my collection every month or so and make a scene. This post is new and fresh, a first timer here. 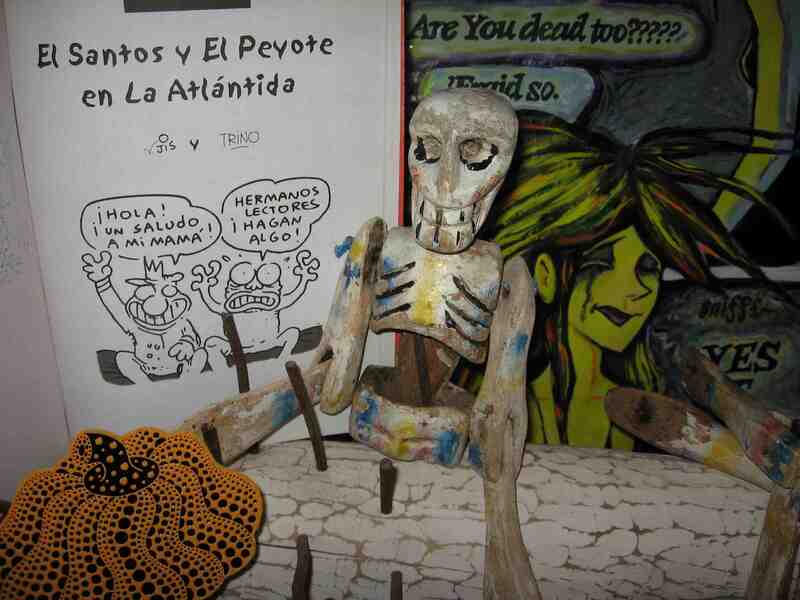 On the coffee table there is an actual Day of the Dead (Día de los Muertos) skeleton doll (it’s that time of the year with Halloween just a few days away) and a large format comic El Santos y El Peyote en La Atlántida by Mexican cartoonists Jis and Trno. I met these guys at ICAF some years ago where I also first met Gene Kannenberg, Jr. Jis and Trno each did a drawing for me in their comic book that I bought. Their comic is really funny, strongly satirical and in Spanish. The doll has removed his legs and is relaxing on a wooden sculpture called Cloud by Australian artist Richard Black. There is also, appropriately, a Dancing Pumpkin postcard by Japanese artist Yayoi Kusama and a Grateful Dead poster from the Stanley Mouse studio for some concerts at the Avalon Ballroom. Setting these elements off in the background is a painted enlargement of a death scene page from Louise Graber‘s comic Black Light Angels. In the foreground, barely visible, just an edge I suppose, is the coffee table but the coffee and cake are out of frame. 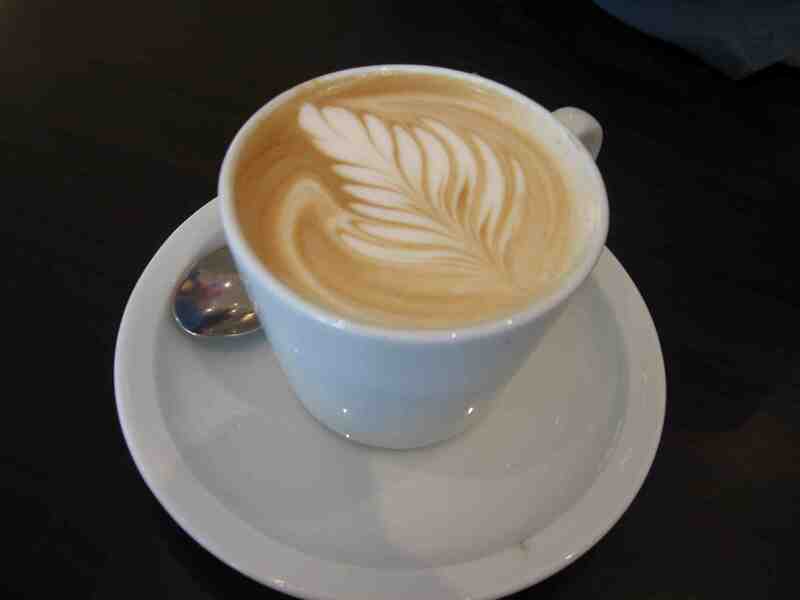 BTW the coffee was Italian and the cake Chilean. The table has orange ceramic tiles, suiting the thematic colour, and was made in Orange, NSW. Let me know what you think about all this. Yayoi Kusama’s Dancing Pumpkin postcard. Bones and roses in 1966 Grateful Dead poster Skeleton and Roses designed by Alton Kelley and Stanley Mouse. 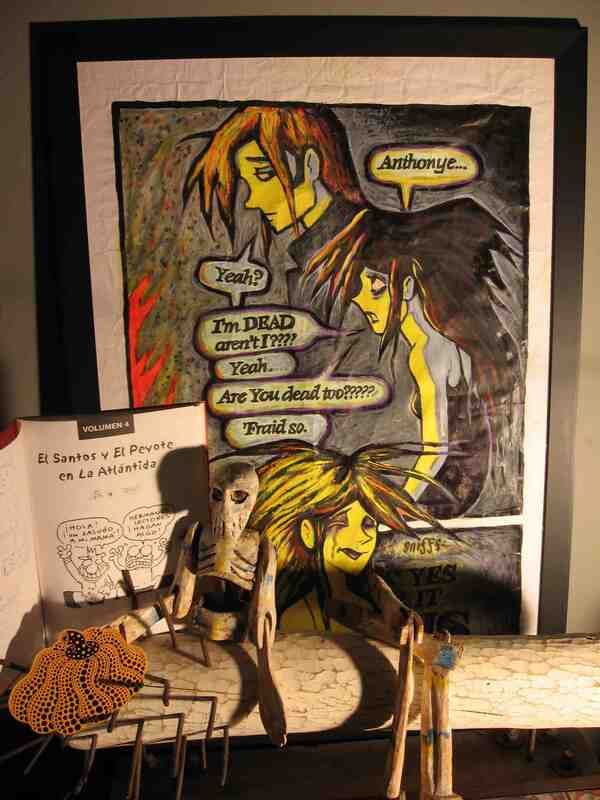 This entry was posted in Art, Coffee Table, Comics, Japanning and tagged Alton Kelley, Black Light Angels, comics art, Day of the Dead, Gene Kannenberg Jr., Grateful Dead, Jis and Trno, Louise Graber, Mexican comics, Richard Black, Stanley Mouse, Yayoi Kusama by Doctor Comics. Bookmark the permalink.